A campaign dubbed “demand better Malawi” has taken centre stage on Twitter with a myriad Malawians tweeting the phrase as a sign of solidarity amidst the country’s hardships. Apart from uniting Malawians in the diaspora with those at home, the campaign serves to send a strong message about change to relevant authorities. It has attracted some notable figures as they have been spotted participating. Having been noted on Monday, the campaign has been spreading like wildfire and there is a higher probability about numbers trippling. Some tweets with calls for change in Malawi. 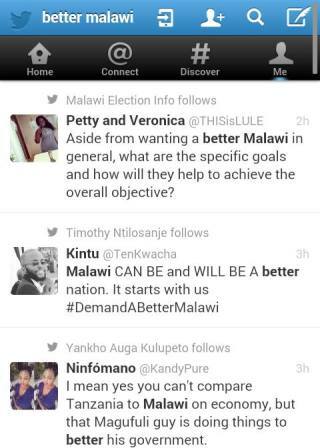 The “demand for a better Malawi” was tweeted for more than 2000 times on Monday alone. Campaigners are alluding their demands to the pathetic situation which the country is going through. The nightmarish conditions that have motivated them to take action range from economic disgrace to food shortages. It started as a small thing with less than ten people playing a cheerleading role to what has now turned out to be a countrywide campaign. The call has come when days for 2015 – probably a year Malawians will live to curse its existence – are numbered. While others have refused to have kind words for the compaign, others believe its high time the country changed for the better and they have spoken strongly about it. I hope it will work in Malawi as it has failed here in South Africa. All the best. Go after ngodzi in Matowe ma kopni ali pa sale. Ndizosavuta Kupeza Nokha Maumboni, Pitani Ku ………………… Mukadziona. Enu Bingu waulula ku BBC zana kuti 30% ya ndalama ya boma anaba brother wake. Ngati inuyu ant corruption mwachitapo chani. Inu Malawi is the poorest country I’m the world do you think corruption ingathe? home affairs mzuzu ,,,,,,ummmmmuh worse! Guyz nkhani ya ziphuphu amatchuka ndi amene amatenga zochepa like k500, k1,000 but those getting huge sums you will not see them on the list. Talk of political leaders, and other big fishes. So let us have a close look on this. Let us know the meaning of a bribe otherwise. Ena amati its a thank you but in reality its just that. Kkk malawi uja inu,zngatheke zimenezi? ku sanjika =cashgate akaba samangidwa ndiye mukufuna kulimbana ndi a traffic. Katangale Sadzatha Mukayambe Mwamanga Atsogoleli Andalewa Makamaka Olamulawa! Osamakondela Pamenepo Mukufuna Opalamulawo Akhale Amphawi Bas Muzizunza Kagwilen Olemelawo Za Chamba! asa.. mpaka email?… tizinena pompa…. Jst board a minbus or a non-passenger vehicle.U wl UNDOUBTEDLY see traffic police askng or receivng bribes. Who cares! we are paying K6000 for S/Fetlz, n u won’t do nothing mukupusitsa ndani? So you think this can be a conducive way to tackle bribery what about those who pay? Do they don’t deserve to be brought to justice too? Ndizoona koma pakanakhala bungwe lokhala ndi anthu gati ma C I D ndikumafufuza mu makampani, Immigration,Road Trafk ndi mwina motere…. Subsidy fertilizer is on the hands of vendors in Mchinji District and Farmers World and Kulima Gold as Government agents they are demanding Farmers to pay extra money to afford to buy the Subsidy. Ndalama ikuvuta kupeza and at the same time ma fine,taxes,duties athu ndiokwera koooooooopsya.or mutatani ife sitingasiye cos zimapindulira ifeyo…..name a country where theres no bribery????? Don’t be dull my brother,go in Tanzania if you will see this nonsense! Ndipo amene amalandira ziphuphuwo amatithandiza kwambiri ndipo kumaulula si u munthu umenewo. Ziphuphu tinazizolowera kwambiri.